How does anyone, large or small, preserve brand identity as they grow? At the heart of the success of any business is its communications strategy. It needn't be particularly sophisticated. It just needs to be clear, focused and executed properly. In fact, the simpler the better. And the results are difficult to deny. Consistent, coherent and compelling brand communications that are well delivered to the right audience mean greater brand awareness, greater leads and sales conversion opportunities and above all, business growth. How do you get the ideal brand communication and ensure that you stand out for all the right reasons? Well, it may not be the perfect solution for everyone, but let me share what worked for our role models and what seems to be similarly working for us as we’ve undertaken our own journey of brand reinvention. 1. Be true to your audience. Take a focused and unbiased look at what your target customers want, which isn't the same as what you want to tell or sell them. One of the most common fails for new businesses starting out (and for a number of established businesses wanting to grow or needing to change) is not being honest with themselves at this stage about what's really going to sell. Another vital piece of advice is to not fall into the trap of trying to mean something to everyone or trying to be liked by everyone. That will only put you in danger of becoming generic and/or meaningless. The most successful businesses focus their energies on a clear and distinct target audience and aim to create a really strong connection with them. Others can always follow as targets later on. 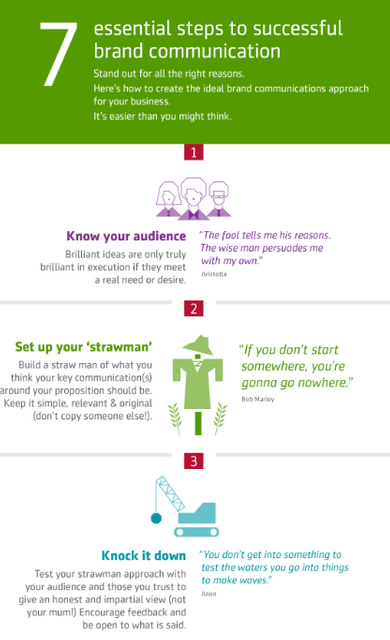 Build a straw man of what you think your key communication(s) around your proposition should be. What is your core purpose? What makes you special and distinctive for your target audience? Ensure it genuinely is something different and keep it really simple. Simple = memorable and meaningful. And remember, even at this stage, it cannot be all about you. Your messaging should be about how your customers lives are better because of what you're offering. It's about them. They choose. You serve. Invite your staff, customers, family, business partners to take a look at your strawman. Encourage them to challenge it, and to challenge you. Be open to their feedback, even if you don't necessarily agree. They may have insights and perspectives that you hadn't considered and that can help you fine tune your messages. Ultimately, however attached you are to your strawman message, if nobody else gets it, you're not going to pass 'go' anyway. So this stage is time and effort very well spent. 4. Be authentically yourselves - across the team. Allow everyone who will be communicating the message to contextualise it in their own authentic way. This is about ensuring they can deliver the message clearly, but in their words. This is categorically not about getting everyone to learn a script and then recite it. AI might be the trend of the day, but we are not all robots and if your messages are not delivered in a genuine and credible fashion, they won't strike resonance with anyone. If you have a personal story that’s relevant to your brand journey and what you stand for, share it. That’s another really key revelation that we’ve learned along the way. It’s a brilliant way of enabling every member of the team to speak authentically about what your business means to them and how it makes what your brand stands for so important. Spend time carefully considering who needs to know this message and what sort of attention span they’re likely to have. The best messages are short, to the point and whilst internally, they can take a long time to perfect, they’re often the ones that end up sounding self-evident. Do any of your messages need a bit of a tweak for different audiences? Tweaks are fine, so long as everyone you need to deliver this message consistently doesn't end up getting muddled up with which version applies to who. The simpler you keep messages, the easier they are for others to remember and to deliver the way you want. 6. Make it easy, personal and engaging - for everyone. Find a neat way to help your communicators remember the messages. In our case, this took several strands. We practised them together, exploring what they meant to each communicator, telling our own stories or illustrations about them. Then we created a simple infographic together, that we could all access and also share with others, both within our business and also outside of it. If everyone knows what you stand for, it makes conversations, networking and doing deals so much easier and faster. The attached article by Lisa Barry for Zunos is a good read about why it’s important to ensure that everyone within your business who needs to be able to communicate your brand messaging (so they can successfully generate leads and conversions from those communications), knows exactly what those messages are and they’re proficient at communicating them. Whilst Barry's article intends partly to promote technology designed to empower businesses with a central focal point of reference for core brand communications, the premise on which the technology has been created holds true: badly constructed, fragmented and inconsistently communicated brand messages will undermine the ability of your business to achieve its objectives. Since then, we've created videos and all sorts of other internal and external-facing materials that make these messages come naturally to us and make them recognisable to others. There won't be a one size fits all approach to how you achieve this. How and where you communicate your brand and promotional messages must always depend on how and where your audience will be open to receiving and considering them. And again, that last point may well mean that you'd do well to break with tradition and to not fall in with the same approach used by all your rivals to attract the attention of that same audience. Nobody ever stood out by copying everyone else. Even if you are communicating something differently, it's a very rare person that is heard shouting above a sea of fellow shouters all positioned in the same spot. Here’s a comprehensive view of our infographic on the 7 essential steps: 7 essential steps to successful brand communications. We hope you get as much out of those steps as we have done. You're on our blog and updates site, which is hosted by elXtr. elXtr is a leading online legal information service owned by LHS Solicitors. When partners and employees have to piece together information from multiple sources or learn how to navigate a maze of unfamiliar tools, they get frustrated. This kind of organization isn’t organized at all, it’s a fragmented mess that leads to inefficiency. .... In the end, the customers are left confused and turned off the brand entirely. Enterprises need to communicate their brand and message from the top executives all the way through each channel partner and down into the sales teams that interact with customers on a day to day basis. Why You Should Start Building Employee Advocacy on Day One https://t.co/kyWi6y5IGY Engaging employees as powerful #brand advocates.